State number 25! This is our first week in Georgia, and even though we’ve been heading north since we left the Keys, now that we’re finally out of Florida it feels like we are really on our way north now. Very slowly of course. Wouldn’t want to run into any cold weather. Which was not a concern this week. Georgia greeted us with a wave of warm humid weather (including masses of bugs), followed by a few days of rain and clouds. There’s a definite feeling of spring in the air around here. 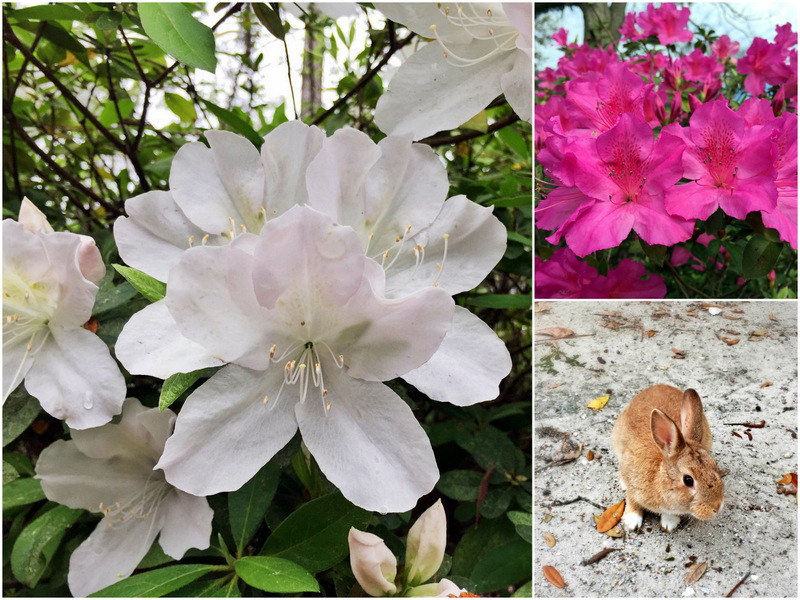 The azaleas are in bloom, the birds have been twittering away all day long, and we even spotted some bunnies! Okay, those bunnies are actually pets that live at the campground, but they still remind me of spring. Our home for the week is Blythe Island Regional Park in Brunswick. 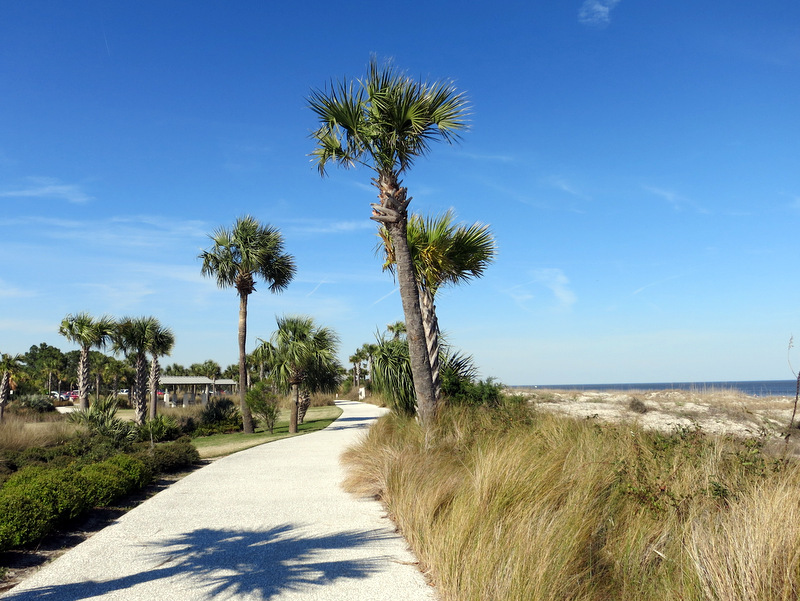 This area was on our radar simply because so many people had mentioned that they liked nearby Jekyll Island. Since we couldn’t get a site at the campground on the island, we settled for the closest public park. Well I can confidently say after seeing both campgrounds that I sure am glad we ended up here. Take a look at our massive pull thru site surrounded by tall trees. All the nightly sites here are long pull thrus with generous spacing, a nice cement patio, and lots of trees for shade. They also offer full hook-ups and cable. Neither of which we have had in a long time. The cable has only served as a reminder of how much crap is on t.v, but the full hook-ups allowed us to get some chores done around the house. Fun stuff like sanitizing the fresh water tank, defrosting the freezer, scrubbing the shower, and replacing the ball seal on the toilet. We also took some seriously long showers. Aside from the campground this large park offers a lake with swimming beach, river access with a fishing pier and boat ramp, a large picnic area, and a really nice network of wooded trails. Early in the week before the clouds and rain rolled in we made two trips over to Jekyll Island. It’s only a 20 minute drive, and although there is a $6 fee to enter the island (not sure what that’s all about) your entry ticket is good for 24 hours, so we actually got in both days for only one entry fee by arriving on the second day before our 24 hours expired. Pretty clever right? 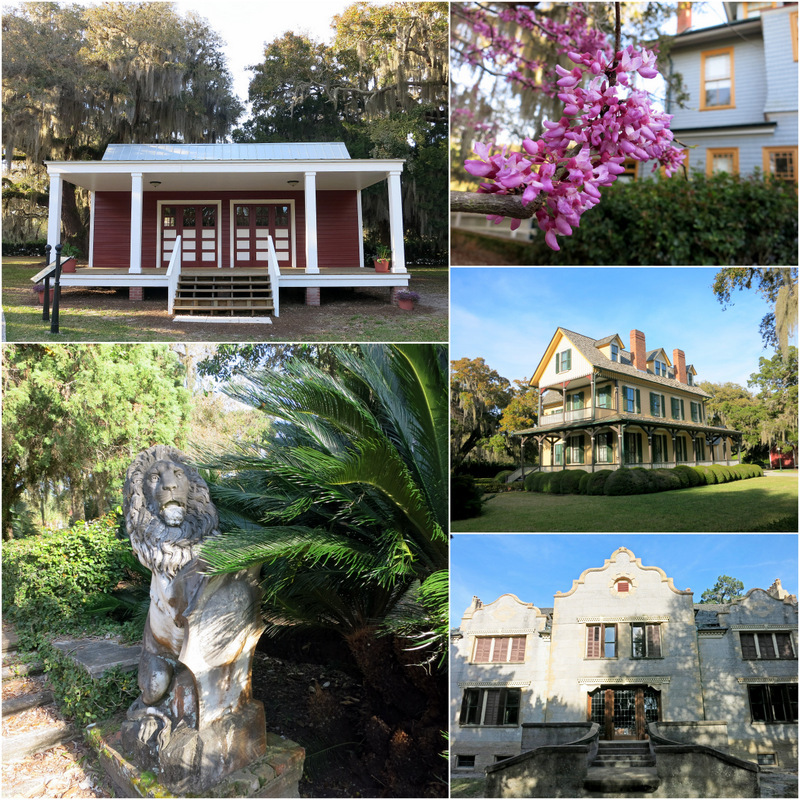 The first day we drove around the perimeter of the island and then toured some of the historic district on foot. Care for a game of croquet anyone? The second day we rode the bike path around the island. Both days we brought a picnic and ate diner on the beach. To be completely honest we were somewhat underwhelmed by the island. Sure the beach is nice, the bike path scenic, and the historic district interesting, but after so many people recommended it I think we expected a bit more. We were also really not impressed by the Jekyll Island Campground. I didn’t take any photos, but from what I saw the sites were cramped with zero privacy. So happy we couldn’t get a site. We really did enjoy our stay at Blythe Island Campground though. In addition to our spacious site the staff was wonderful, and we enjoyed a quiet week among the trees. 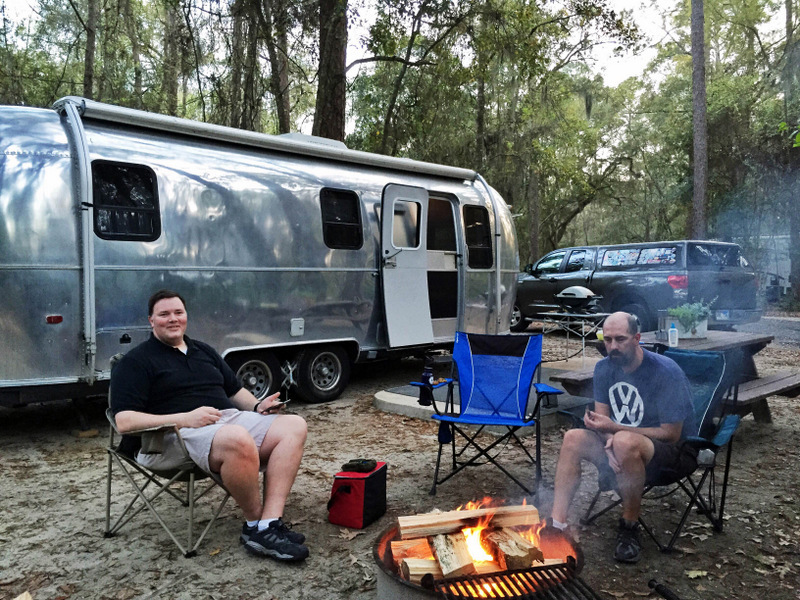 We also had a meet-up with blog reader and fellow Airstream owner Casey. He lives in the area and came over for a night of swapping stories around the campfire. 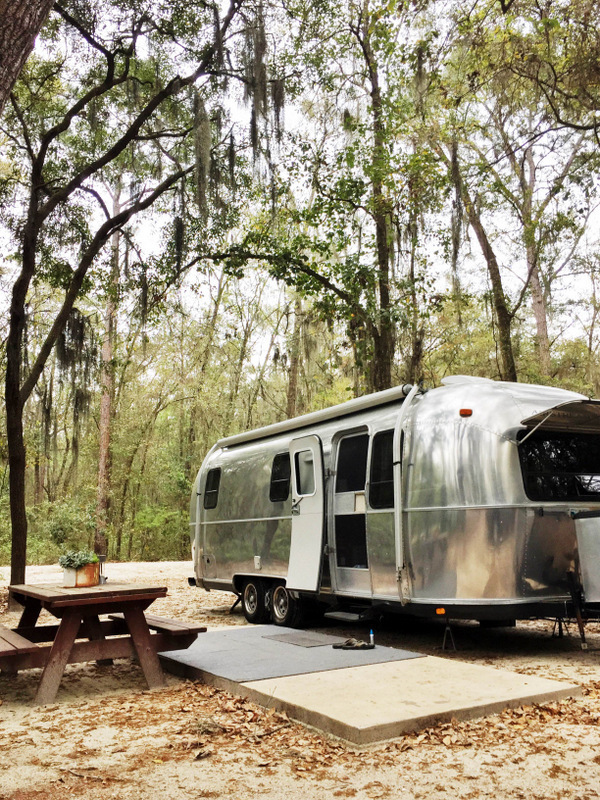 Casey has a beautifully polished 34′ Airstream Classic Limited that he takes out for weekend journeys with his family. He’s so passionate about Airstreams that he convinced his dad and now his neighbor to also buy one! Casey gave us some great info on camping in the area. He knows pretty much everywhere to go within a four hour radius, and after hearing about all the wonderful places that he’s camped, we’re convinced that we need to come back this way again. Maybe next time we can camp with him and see that gorgeous Airstream in person. Be sure to check out the turtle rescue centre on Jekyll Island right beside the historic district. You can even watch as the staff work on the sea turtles. We tried to visit the turtle center, but both days it was already closed when we went past. Next time! 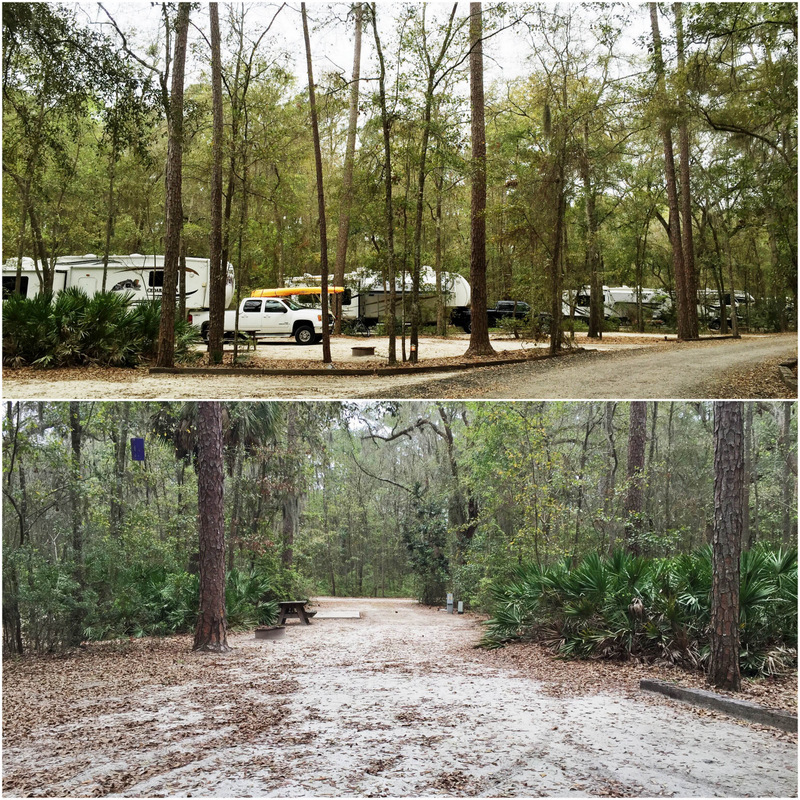 Yikes…we have reservations for 11 days at the Jekyll campground – now I’m nervous about it! We have to be there for a wedding, but if we hate it maybe we’ll leave early and see if we can get something at Blythe Island. 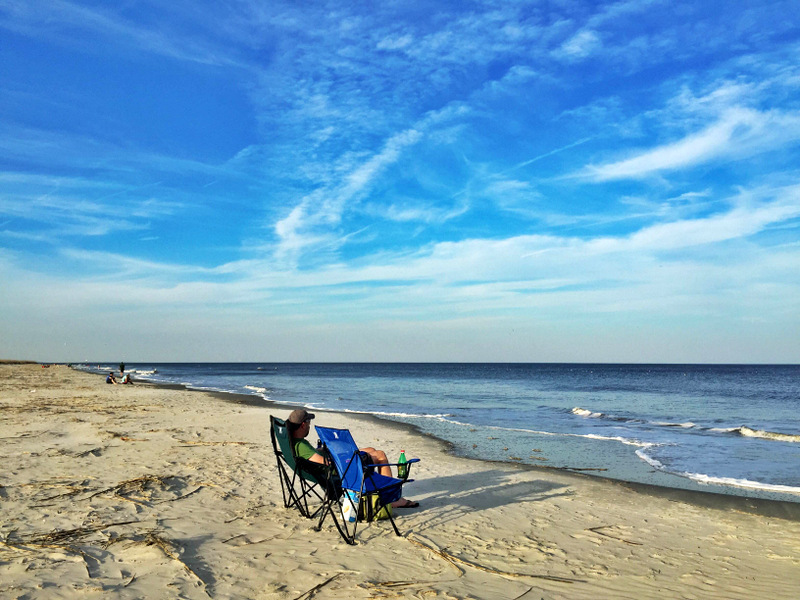 Jekyll Island Campground is truly an amazing place. We stay there every chance we get while in the area. Blythe Island is nice but we totally prefer Jekyll. There is a nice pier within walking distance directly across the street. Good fishing too! 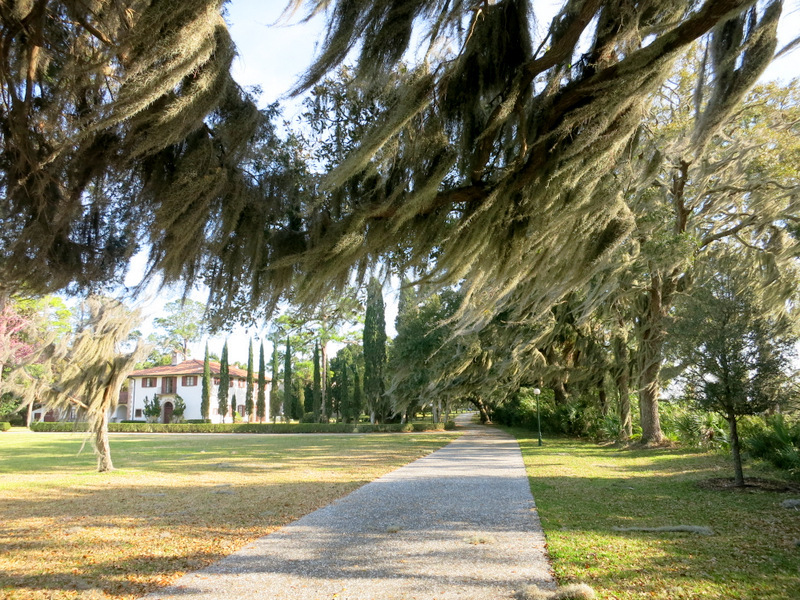 The old oaks and the history on the island is just remarkable. Be sure to visit Driftwood Beach. Not far and anyone there can point you in the right direction. Enjoy your stay and safe travels!! I doubt that you’ll hate it Jennifer, it’s just not our kind of campground. Since we spend at least 8 hours a day working from the RV we place high value on a site with lots of space and privacy, something Jekyll was missing. If you do want to shorten your stay though Blythe Island always had a few open sites. There not much to Jekyll. We used to fly there in our airplane for lunch or a quick night away at the hotel. But after you ride around the bike path there’s not much. The restaurant at the hotel is reasonable for lunch and very good. But it was always only 35 minutes from St. aug by air and we could land right there so it was fun. Coastal Georgia tends to be pretty muddy and bug ridden. Love your blog as fellow Airstreamers. We are similar paths at the moment. Going to Buck-Hall US Forest service CG next week in SC near Awendaw. Looking forward to where you guys are next. Hey we’ll be right near you next week! Headed up to a McClellanville on Saturday for the week. We will be circling back to Hilton Head to see friends. Could only get 4 nites at Buck-Hall but looking forward to it. After that headed N again. Just could not get it coordinated first time through. You’re photos are lovely. Thanks for sharing your journey. We did not stay at the campground on Jekyll but we biked through it and it looked very cramped. 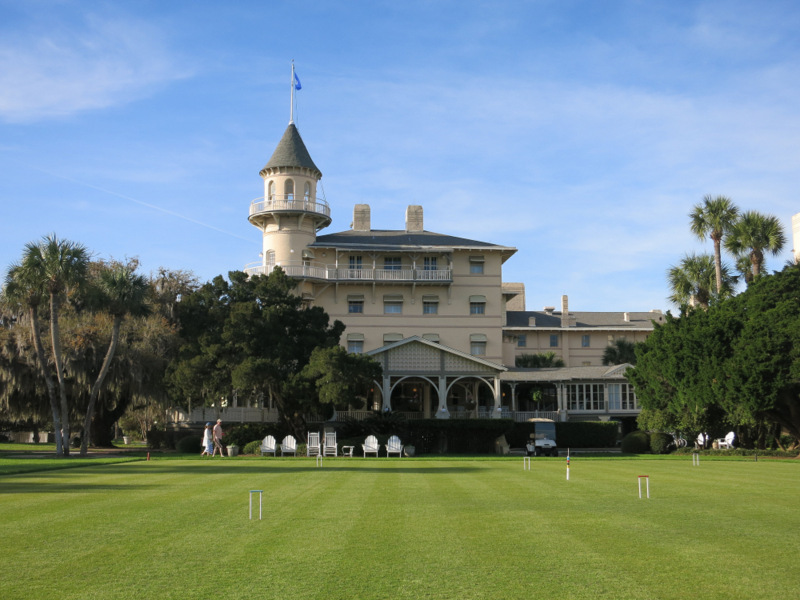 The day we went over to the island there was a game of croquet being played when we biked to the historic hotel. All the players were dressed in white from head to toe, very cool. Our favorite stop on Jekyll was Driftwood Beach. It made for some great black and white photos. Oh how fun! We kind of wanted to play a game of croquet, but assumed that we had to be guests of the hotel. The driftwood beach was very nice. Not sure why no pictures made it into this post. 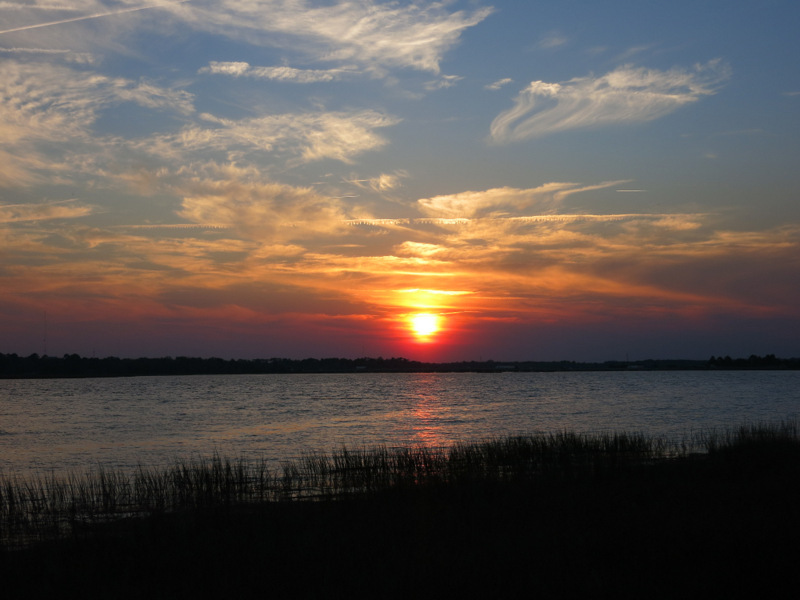 Thanks for the great tip on Blythe Island campground. It looks beautiful — and it’s so luxurious to have full hookups for all the reasons you mentioned. The only thing that would make the campground better is a laundry!! 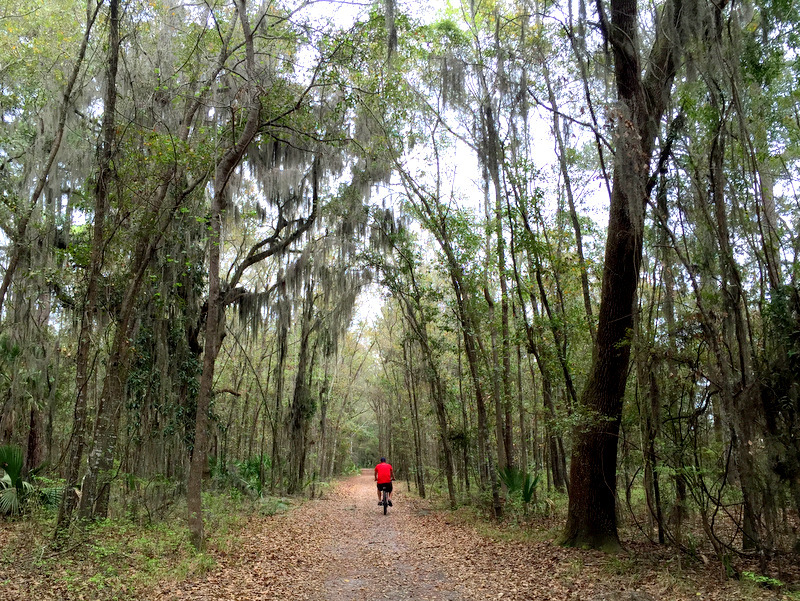 The bike path on Jekyll Island looks like fun. Can’t believe I forgot to mention the laundromat at the park! It was small, but had new machines for a reasonable price.